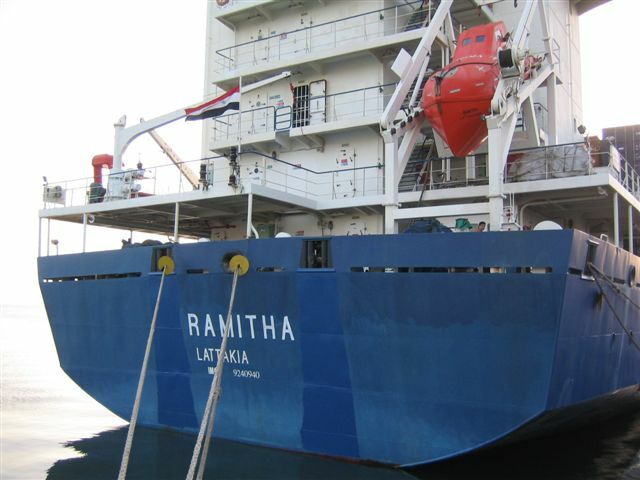 The delivery of MPC Vessel, “Ramitha” took place at Shanghai Port in China, on 30 Jan, 2003. MPC “Antaradus” is the first of two multi-purpose container ships constructed in Qingshan shipyard, Wuhan for Al Sham Shipping Company - Syria. MPC “Antaradus” is a ship of 6,750 deadweight tones, built to Lloyd’s Register of Shipping Classification and to the latest international marine regulations. Main features include ice strengthening, full machinery automation and one-man navigation systems. Three holds, served by two 45 tones cranes, are designed to carry a wide range of cargoes including containers, bale, grain and steel coils. The ship's propulsion comes from a MAN B&W 6L42MC engine of 5970 KW with a service speed of 16.5 kts.